Jerry Falwell Jnr, one of Donald Trump's most prominent faith advisers, has threatened legal action against progressive Christian leader Shane Claiborne in response to being invited to pray with him. Shane Claiborne, founder of the Red Letter Christians movement, invited Falwell, an arch-conservative, to pray with him as part of a two-day revival event in Lynchburg, which is the home of the conservative evangelical Liberty University, where Falwell is president. ReutersJerry Falwell Jnr, whose father was a founding member of the Moral Majority and so-called Religious Right, campaigned in support of Donald Trump's presidency. Along with Tony Campolo, Claiborne is hosting the event near Liberty University to try and show believers can be evangelical and care about the environment, the poor and the immigrant. 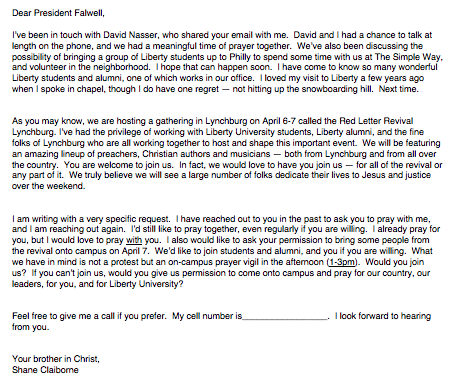 In a letter to Falwell two weeks ago Claiborne invited him to pray with him and students on Liberty's campus. 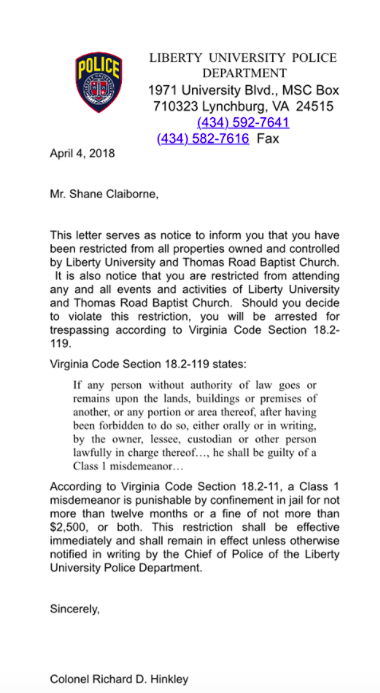 However in response Claiborne received a letter threatening him with up to a year in jail and a $2,500 fine for trespassing if he entered Liberty University property. 'I was very clear that what we have in mind is a prayer vigil not a protest – no signs, megaphones, banners or chants... just Bibles and candles. We had even hoped to do a communion service, inviting folks who disagree politically to come to the table together,' Claiborne posted on Facebook. Claiborne and Falwell have clashed a number of times before with Claiborne challenging Falwell to a debate over whether you can be a Christian and support Trump. Explaining why they had chosen to host the revival on the steps of Liberty University, Campolo said they were trying to reach out to Bible-belt conservative Christians with different political views but the same faith. The letter from the police Claiborne says he received in response to his invitation to Falwell. Shane Claiborne's letter to Jerry Falwell inviting him to pray with him. 'As evangelicalism moves more and more to the right, it's safe to say evangelicalism looks more and more like the Tea Party. I don't think either group would be upset with that comparison. ...Jerry Falwell, Jr., [Southern Baptist Trump supporter Robert] Jeffress, Franklin Graham, among them,' he said in an interview with Baptist News. He added: 'In the 20th century, the focus was on orthodoxy – making sure theologies were in tune with the theology that came forth from the epistles of Paul.